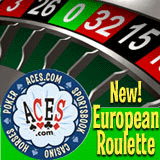 Aces.com ’s newest game – European Roulette – improves players’ odds by eliminating the extra zero added to the American version of “The Game of Kings”. The game is one of the popular online casino’s new instant play Flash games that require no downloading or installation. The first form of Roulette, invented in the seventeenth century by mathematician Blasé Pascal, had no zeros. Early Monte Carlo casino operators added the zero to improve the house odds. When the game arrived in the U.S., Americans added the double-zero to give the ball one more place to land and thus improve the house’s chances even further. There are two other differences between the European and American games. In American Roulette, each player has their own color of chips, all worth the same value. Standard casino chips of differing values are used in the European game. Also, the European table is much larger than the American version, so the European croupier uses a rake to clear chips while their American counterpart does this by hand. Of course, Aces.com’s cyber-croupier just clears the board with a click. Aces.com offers online gamblers all the betting opportunities they have in Las Vegas: casino games, poker, sports betting and horse racing. Later this month, the Vegas-style online casino will be adding three more games to its comprehensive suite of table and card games.